How Will Prefab Affect Employment Opportunities in Queensland? 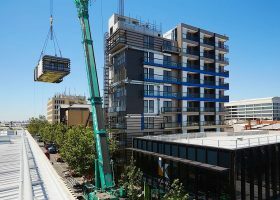 At present, however, it hasn’t eventuated into much more than ‘great potential’ with the current prefabricated Australian market accounting for only three per cent of the total construction industry. Prefabrication in Australia is in its foundational stages and has huge potential for exports, growth and employment. Prefabrication of buildings isn’t new. It dates back to the 1800s in Australia, but many constraints surrounding the building standards and codes prove that it’s not going to be a quick transition to become more mainstream. Within the Queensland market, we also don’t build on the same large volume scales as countries like China, Europe and the US or even as Victoria and NSW, and prefab’s benefits (such as cost reduction) are most achievable when replicable structures are used. These are important facts to consider with building material construction costs increasing substantially over the past 20 years. The construction industry traditionally revolves around on-site construction projects, meaning almost everything is built and assembled on site. They don’t necessarily have the experience or knowledge in prefabrication. People in the construction industry are experts in construction. We need help from fabrication experts, working together with construction industry experts to integrate the two into this new age industry that the future is waiting on. Research has recognised productivity and efficiency gains in construction that can be delivered by advanced manufacturing techniques. The final Ford Falcon rolled off the production line in October this year, leaving many without a job, but with experience in a dying industry in Australia. In many cases, these people are experienced and exceptional workers with extensive knowledge in on-site production line fabrication. Toyota produced its last car in Australia over a year ago, Holden has less than a year left building Commodores and Mitsubishi left our shores in 2008. For the past 50 years Australia has built suburban communities on the basis of the automotive industry and close to 40,000 Australians (according to the February 16, 2016 article Car industry closure puts thousands of jobs at risk published in The Australian) will lose their jobs across many different company streams related to this industry as a result of company closures. It would seem hugely plausible that there is a portion of this group of people that can transition into construction jobs, particularly in prefabrication construction. These skilled professionals can utilise their knowledge and expertise, whilst upskilling in construction gap areas. They can educate and work with construction experts to expand this prefab area of the construction industry into a long-term sustainable industry, which can supply the much needed building and infrastructure projects that will support our growing population. So, why not just continue on the way we are? Why do we need prefab and why can’t these workers without jobs just start from scratch? The simple answer lies in the benefits mentioned time and time again: increased safety, decreased cost, lower weather risk, decreased waste, ability to use sustainable building practices and materials, lower operating costs for developers, builders and owners, meaning a more sustainable industry over the long term. With designers needing to work far more closely with the construction teams when using prefabricated methods, there is a huge opportunity to blend advanced manufacturing processes with conventional construction. Taking inspiration, information and experience from automotive, aerospace and shipbuilding industries. The viability of the manufacturing space within the Australian and Queensland construction markets has already been proven in some areas, with Queensland companies utilising bathroom pods methods in high rise residential builds, accessing the products through outsourced manufacturing methods. There is Commonwealth funding and some state funding available under the manufacturing transition programme to aid in this transition for employees and employers alike. There is also living proof within some companies already, with some having already employed automotive industry professionals to deliver ground breaking prefab construction projects. Harnessing the technology and expertise from other sectors, such as the automotive sector, will be crucial to the construction industry being able to keep up with, (or catch up to) the economic output the rest of the world has already encompassed with prefab construction technology. According to Infrastructure Australia, Queensland will be needing a further 700,000 homes for 1.4 million people over the next 15 years. The opportunity for prefab construction lies in replicable builds – housing, hotels, student accommodation, even retail chain companies. The higher the level of replication, the higher the overall positives of prefab. There is already a skills shortage fear in certain areas of the industry at present, and this opportunity will provide the potential for a more diverse range of talent, with wider and different skillsets. The prefabrication revolution gives employers the opportunity, whether in the design phase or the manufacture and build phase of a prefabricated project, to hire exceptional staff that will offer innovation, high work quality, speed and accuracy, and longevity. It will enable international competitiveness for growth in a market for new building products. Our industry is moving forward and the move toward a combination of lean manufacturing and construction is a likely evolution for many areas of the market. Those who embrace the change and are willing to look at talent in areas that they may not have considered up until now will be at the leading edge.